If you own an old or damaged headstone, there is no need to replace it, why not have Douch Family Funeral Directors clean it for you? We specialise in memorial and headstone cleaning. 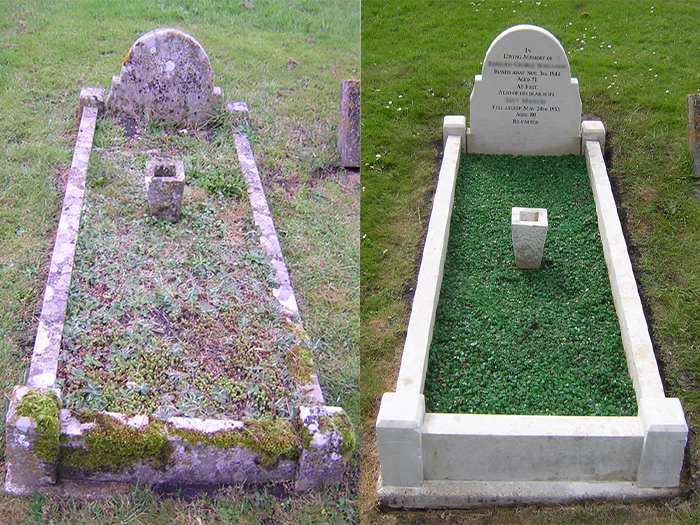 We take great pride and care in restoring loved ones memorials and headstones back to their original appearance. Memorials, especially in Purbeck and Portland stone together with Marble, are porous and can weather badly over the years, but with our restoration methods, the stone can have a workshop finish once cleaned. We can re-paint or renovate existing lettering to any type of memorial, including granite, and add additional inscriptions at the same time as they are cleaned and renovated. We also supply new memorials, carry out additional inscriptions, and supply flower containers, statues and various graveside ornaments. For an estimate of costs, please complete the enquiry form, below. Rather talk to us in person?